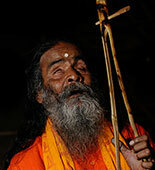 When he was six months old, Kanai Das Baul had smallpox and he went blind. His parents - simple day labourers - despaired as to how their son would make a living. Then, one day, when Kanai was 10, a passing Baul, heard him singing. His voice was high, sad and elegiac, and the Baul asked Kanai`s parents if they would consider letting him join him as a pupil. In due course, Kanai set off along the road, learning the songs and the ways of his guru, and becoming, in time, one of the Bauls` most celebrated singers. After the death of his guru, Kanai and his wife took up residence in the Tarapith in Birbhum where, in the holy crematoria, he sings of love and death. In 1996 Ranjan Palit made a documentary on Kanai Das, `A Magic Mystic Marketplace` which won the Golden Conch (1996) and the UNESCO Prize (1997).